BJB have recently revamped their corporate image completely. The first major appearance of the new CI was realized on the German Event Light and Building in Frankfurt last year and the designers of the booth there were asked to make the concept also fit to the much smaller booth in Tokyo. We received a detailed briefing and some reference pictures from the German booth together with the Tokyo design plans and were asked to make this happen in Tokyo too. Quite a challenge with the oval interlacing shapes, but we thrive with challenges like that and the result was “gorgeous”, as one of the BJB attendants put it. We would like to thank the designers in Germany for such a good concept. Especially the horizontal break throughs in the oval tower, which let the inside bright illumination spill out were really making the design stand out. Also the cute mascot characters on the graphics - various insects - surely helped to make the appearance of the booth to stay in the memory of many visitors. BJB develops and produces sockets for lighting fixtures. The Germany based company has a long, solid track record of quality and innovation. At our former employer, we served BJB on their Lighting Fair booths for years, until BJB HQ Germany decided to shift their Japanese marketing to a new agency. 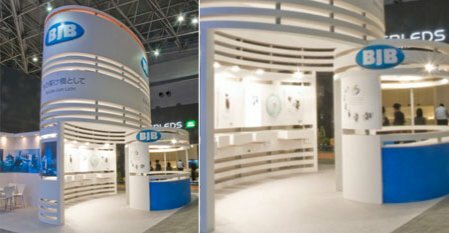 We lost sight of BJB for a few years, but were re-invited by the advertising agency to direct the booth design and construction in 2007.